Kyle Fryatt scores Whitley Bay's fifth goal against Ryhope CW. 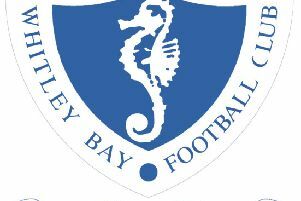 Whitley Bay got their Northern League season off to a flying start thanks to an excellent second half performance against first division newcomers Ryhope CW. The cliché ‘a game of two halves’ was never more appropriate as Ryhope deservedly led at the interval but were swept aside after the break by the home side’s blistering start to the second half. Whitley Bay scored four times in a nine-minute spell of fast and flowing football. Unavailability and injuries left the home side with a depleted squad as they took on a Ryhope side that included former Bay manager and FA Vase winning captain Leon Ryan in their ranks. But on a warm and sunny afternoon its was Whitley’s acting captain Callum Anderson who produced the first attempt on goal with a tremendous 25-yard effort that flew inches past the post. The visitors looked lively and capitalised on a moment of good fortune when a ball into the Bay box rebounded off keeper Tom Flynn and Matthew Weirs seized his chance to slot the ball into the net past the stranded keeper. Ryhope were having the better of the exchanges and Whitley lacked a cutting edge, managing only two chances of note. Midway through the half Callum Patton sent a 20-yard effort just wide, and then six minutes before the interval, a spectacular volley from Adam Shanks rippled the side-netting. Ryhope fully deserved their lead and in stoppage time they almost got a second when Melvin crashed a powerful shot off the bar. Whatever was said in the Bay dressing room at half-time certainly had the desired effect as within two minutes of the restart they were level. Kyle Fryatt fired a left footed shot past Rookes from ten yards. Less than 60 seconds later Andy Robertson raced clear down the right and put Whitley ahead with a shot under the keeper’s dive. It was all Whitley and straight from the restart they broke forward again and Chris McDonald brought a fine save as Rookes finger-tipped the ball just over the bar. The onslaught continued and Patton crashed home the third goal from the edge of the box. McDonald saw another attempt blocked before Shanks so nearly added Whitley’s fourth, but his close range finish was blocked by the keeper. However, he reacted quickly and played the rebound into the path of Callum Munro who poked the ball into the corner of the net to make it 4-1 just over ten minutes into the half. Ryhope looked stunned but to their credit they kept going, and Weirs struck a shot against the post as they tried to get back in the game. It was an impossible task for the visitors as Whitley continued to play some neat and incisive football that left the Ryhope defence struggling. The final goal came with just over a minute remaining and it was a classic individual goal, scored by the impressive Fryatt, recovered from injury that forced him to sit out several pre-season games. The former Shildon man cut through the Ryhope defence before sliding the ball home to the delight of the fans. This win represents Whitley’s best start to a league season in many years and was achieved without one of their influential players, Alex Kempster, who is due to return from holiday this week. Also worthy of mention was the performance of referee Stephen Dial, who controlled the game extremely well and with the minimum of fuss. Whitley Bay: Flynn, Munro, Allen (Potter 70), Gibson, Wilkinson, Anderson, Fryatt, Patton, Robertson, Shanks (Berry 84), McDonald.